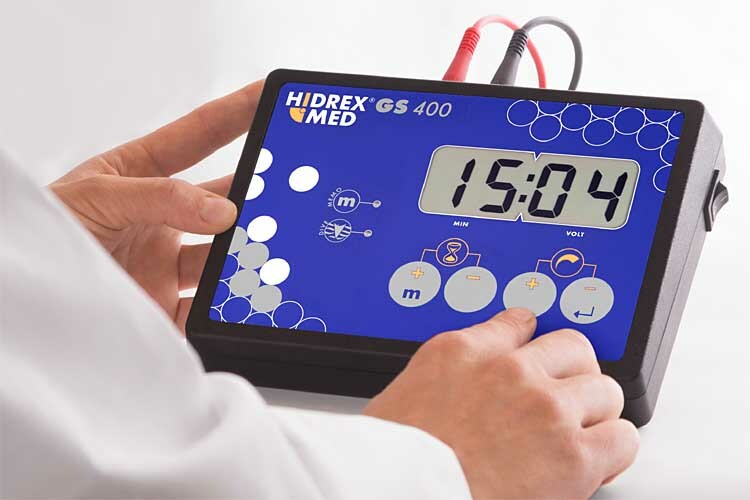 The Hidrex GS 400 (DC) is an iontophoresis machine for the treatment for hyperhidrosis and comes with an eight week money-back guarantee. Stainless Steel electrodes – the device comes with Aluminium electrodes as standard but can be fitted with Stainless Steel electrodes instead. Stainless Steel electrodes are easier to clean and require less frequent. They are more scratch resistant and can resist attack from calcium. If you do not suffer from a nickel or chromium allergy we recommend the option of stainless steel electrodes. The purchase price includes access to an experienced support team who can advise you in your iontophoresis treatment plan. Access to the Premium Support Iontophoresis Forum where you will find a lot of helpful information including an e-book on iontophoresis and hints, tricks and tips from other successful users. 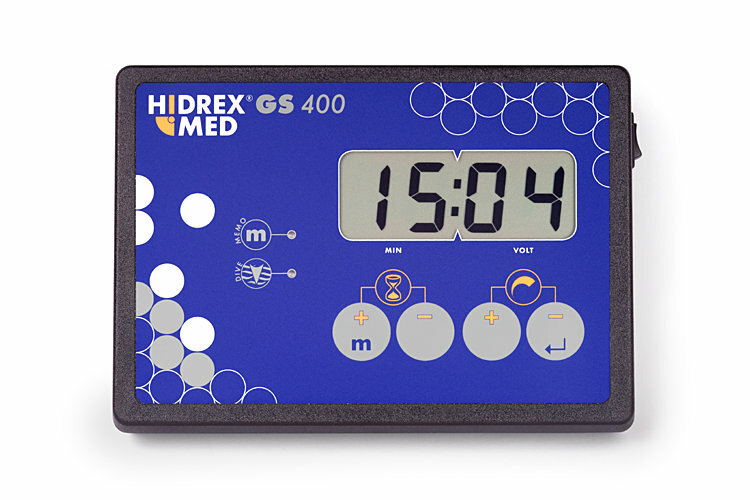 Particulars of Hidrex GS 400 (DC): The device is operated by means of a stable and scratch resistant control pad. Similar type control pads and buttons are used extensively in the medical industry and can withstand heavy use before wearing out. This is a traditional iontophoresis device producing DC up to 60 volts, 35 mA. You can choose treatment times of up to an hour. Do-it-yourself home use even when only treating hands. Other models are characterized by a footswitch. This device automatically recognizes the therapy start, slowly builds up the treatment current and at the end of the treatment will switch the current off again. Also available with switchable Direct and Pulsed Iontophoresis current for very sensitive patients (e.g. for the treatment of severe sweating in children) and absolutely recommendable for hands and armpit sweat treatment. 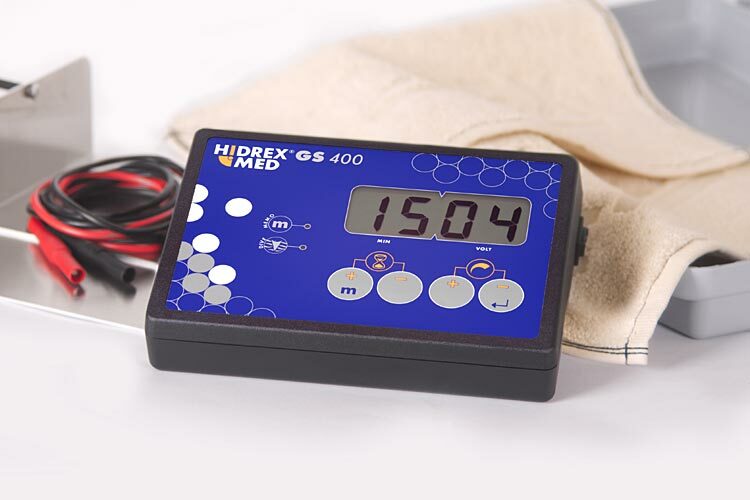 This site contains a product presentation for the GS 400 HIDREX iontophoresis machine, used for the treatment of excessive sweating. Are you looking for help with excessive sweating and want to learn more about iontophoresis? Here you will find an overview of the features and performance of our suite of iontophoresis machines and you will have the chance to purchase one of these machines online. The Hidrex device is a powerful iontophoresis devices used for the fight against excessive sweating on the feet.